90 People Dinner Wedding Disposable Plastic Plates Silverware Silver Rim Party! Brand New, Original Package, Sealed Box. Brand New 90 People Dinner Wedding Disposable Plastic Plates Silverware Silver Rim Parties! This amazing set of disposable tableware is perfect for any occasion. This is heavyweight disposable tableware that will impress your guests. People won't believe it's plastic! Elegance and sophistication combined with great quality. This classy silver collection suits every setting. You are able to use for weddings, birthdays dinner parties. 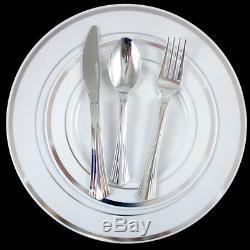 The 10 main course dinner plate: usually used for formal dinners, weddings, etc. The 7 salad or dessert plate: this plate is generally used as a salad plate. You will never have the hassle of having to wash, they look beautiful and are disposable at the same time. Combo for 90 people includes : 90 pcs - Double Rimmed - 10'' Plastic Dinner Plates 90 pcs -Double Rimmed- 7" Plastic Salad Plates 90 Plastic Silver Forks (length 6.75'') 90 Plastic Silver Knives (length 7.5 ") 90 Plastic Silver Spoons (length 6.25). 90 People combo disposable tableware set 90 pcs - Double Rimmed - 10'' Plastic Dinner Plates 90 pcs -Double Rimmed- 7" Plastic Salad Plates 90 Plastic Silver Forks (length 6.75'') 90 Plastic Silver Knives (length 7.5 ") 90 Plastic Silver Spoons (length 6.25) Disposable They are plastic but look real Use for wedding dinner parties and more Never have the hassle of washing Elegance and sophistication combined with great quality. Package Contents - Accessories Included. 90 People combo disposable tableware set 9 Packs of 10 pcs 10" plates 9 Packs of 10 pcs 9" plates 15 Packs 18 pcs cutlery set. Usually same day of receiving your order (on weekdays). Your order will be professionally packed in sturdy boxes or padded envelopes to ensure your items arrives quickly and safely. Algeria, Panama, Burkina Faso, Brunei Darussalam, Angola, Honduras, Libya, Côte d'Ivoire (Ivory Coast), Russian Federation, Morocco, Mali, Lebanon, Swaziland, Tajikistan, Egypt, Kenya, Mauritania, Suriname, Congo, Republic of the, Ukraine, Reunion, Liberia, Nigeria, Bhutan, Cameroon, Uzbekistan, Mozambique, Belarus, Venezuela, Guinea-Bissau, Kazakhstan, Senegal, Guinea, Tanzania, Philippines, Lesotho, Seychelles, Oman, Sri Lanka, Turkmenistan, Malawi, Georgia, Cambodia, Togo, Jordan, Argentina, Ethiopia, Nicaragua, Madagascar, Guatemala, Turkey, Benin, Eritrea, Saudi Arabia, Haiti, Kyrgyzstan, El Salvador, Colombia, Chile, Bahrain, Uruguay, Singapore, Western Sahara, Mauritius, India, Peru, Vietnam, Equatorial Guinea, Uganda, Bolivia, Congo, Democratic Republic of the, Yemen, Tunisia, Mongolia, Ghana, Zambia, Iraq, Ecuador, Dominican Republic, Rwanda, Dominica, Nepal, Gambia, Chad, Central African Republic, Somalia, Qatar, Jamaica, Falkland Islands (Islas Malvinas), Costa Rica, Afghanistan, Brazil, Germany, Cape Verde Islands, Niger, Djibouti, Sierra Leone, United Arab Emirates, Macau, Paraguay, Thailand, Botswana, Romania, Armenia, Burundi, Saint Helena, Zimbabwe, Mayotte, Bangladesh, Comoros, Azerbaijan Republic, Namibia, Gabon Republic, Pakistan, Kuwait. Boxes, AK, HI, PR and APO/FPO addresses. Major holidays include New Year's Day (or the day after if New Year's Day falls on a Sunday), Memorial Day, Independence Day, Labor Day, Thanksgiving Day and Christmas Day. As part of our policy, we don't allow pickups, NO EXCEPTIONS. Please ask all questions before placing your order. Once you place your order you are obligated to pay for it. All expenses must be approved by AllTopBargains or we will not reimburse you for the return charges. In the event that a return is required, we will test and diagnose the item. If we find the item is defective, we will attempt to repair or replace the item. Add my store to your favorite to receive newsletters on offers and special promotions. The item "90 People Dinner Wedding Disposable Plastic Plates Silverware Silver Rim Party" is in sale since Tuesday, March 13, 2018. This item is in the category "Home & Garden\Greeting Cards & Party Supply\Party Supplies\Party Tableware & Serveware". The seller is "alltopbargains" and is located in Hallandale, Florida. This item can be shipped worldwide.